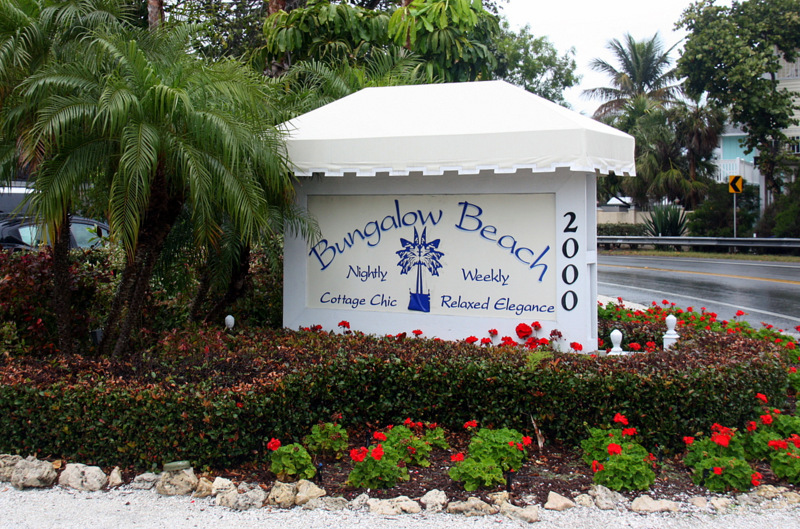 The cottages at the Bungalow Beach Resort on Anna Maria Island on the west coast of Florida are special for several reasons. Here’s what we found one rainy day on the fabulous Gulf Coast. It was already raining when we made a left turn off Highway 64 in Bradenton and onto Highway 789, the road that runs north and south and divides the island. We immediately began to search for the sign for the Bungalow Beach Resort. This was our first trip to Anna Maria Island, and for some inexplicable reason we expected the vibe to be a little like Nantucket Island circa1942 – but we were way off the mark. Anna Maria Island is a busy, seven-mile long stretch of sugary sand, restaurants, condominiums, and assorted homes ranging from Early Prohibition to Modern Glass. It only took a few minutes to realize that the variety of structures on the island all came nicely together in a great place for a beach residence or second home – and where a family on vacation could quickly interact with the sea and sand. Between wiper swipes, we managed to identify our destination. At first glance, the property, which is nestled between taller buildings, looked quite small. It was still coming down when we pulled into the unpaved parking lot that fronts the one-story bungalows. The office faces the street and we made a mad dash through small pools of water in the sand. We hadn’t packed an umbrella, so we got a good dose of Florida’s liquid sunshine on our short trek. It was in the resort’s tiny office that we first realized we were about to take a trip back in time. We just didn’t know what a marvelous journey it would be. The downpour had subsided during our check in. The puddles where still evident, but the porous earth had soaked up much of the standing water. We retrieved our bags from the trunk of the car and made our way along a curvy sand path toward the beach. Our bungalow was number “102” and faced the Gulf. It was just a clam throw away from the waves quietly rolling along the shore. The winds were calm, so the sea was tranquil and smelled sweet after the rain. We watched a string of pelicans gliding so low that their wings skimmed the tips of the gentle swells. We looked up and down the shore – except for the occasional clumps of sea oats and palms – it was empty. The uncommon desolation was quite soothing – and we began to relax. The Desoto bungalow was picture perfect and retro-luxurious. 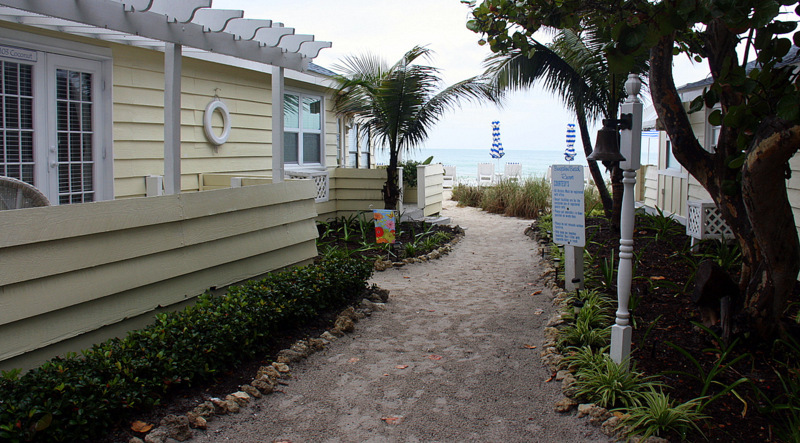 Although we had missed the mark about Anna Maria Island, we hit our goal of finding “Old Florida” right here at the Bungalow Beach Resort. We had just arrived a few minutes before, but we were already beguiled by the elegant simplicity of the surroundings. This is a place where tradition pervades – 1930s style. Before long, we were unpacked and uncorked. A fine Pinot Gregio complemented our growing mood of relaxation, harmony, and contentment. It started to rain again with the sound of a gentle patter on the porch roof. 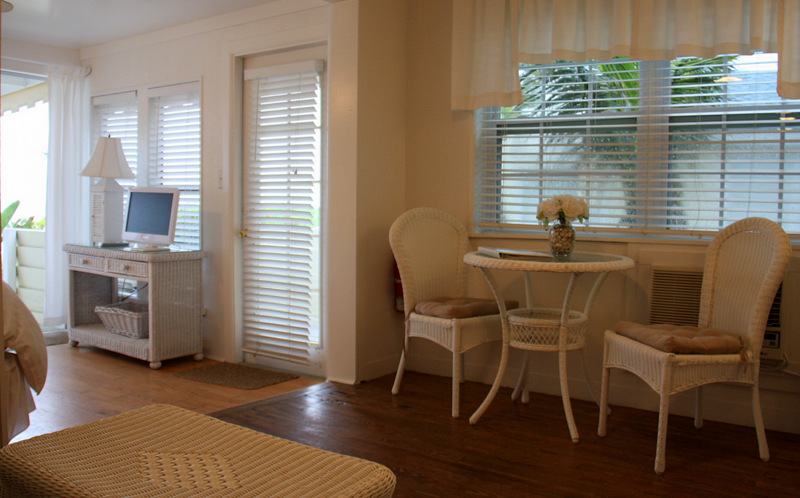 We quickly settled into the white wicker chairs under the protected patio canopy and watched a symphony of dancing drops on the bungalow railing. The rain eventually turned to a slight drizzle, and along with the temperate sea, created an easy environment for libation and laughter – just as it must have done for scores of other couples across the eight decades of the resort’s existence. We speculated about other vacationers enjoying these charming little bungalows in the early 1940s. We supposed how they would have dressed for their trendy beach vacation on Anna Maria Island. As we pondered the deserted beach chairs directly to the front of our bungalow, we conjured up images of young couples – now old – that once took in the same view, on similar rainy days. Wherever they are, we hope they still remember that dreamy day at Bungalow Beach Resort and smile. We know we will. Before long, darkness cloaked the Gulf. It was time to end our wonderful day with a restful slumber in luxurious comfort. 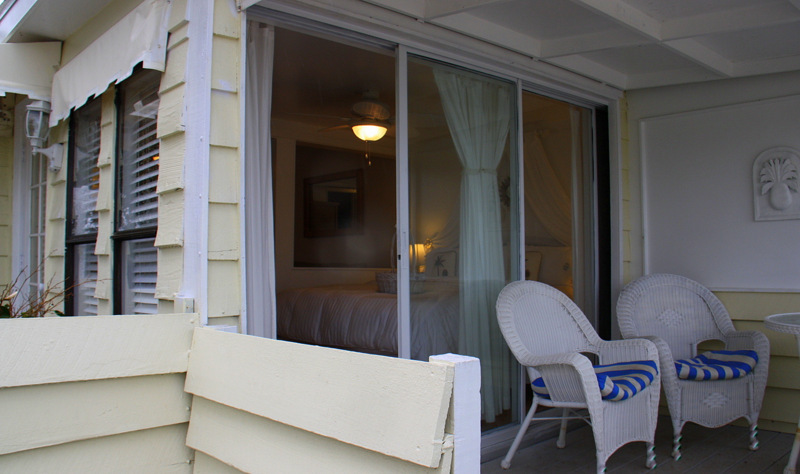 We recommend the Bungalow Beach Resort to anyone interested in a nostalgic private beachfront haven with ceiling fans, window air conditioners, a kitchen, a small pool – and all the contemporary amenities that make for a romantic or memorable family island vacation. This resort is a salute to the past while embracing the new and now. 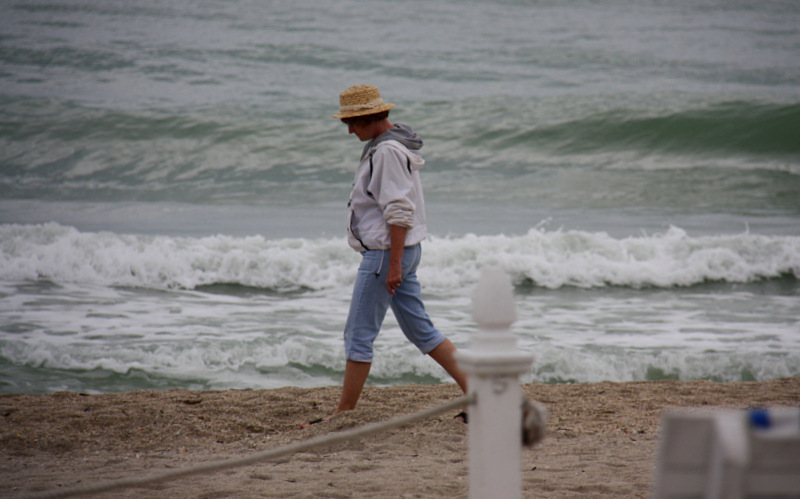 It is all about fun, sand, and sea, but if you are lucky – maybe you will get a soothing rainy day as well. 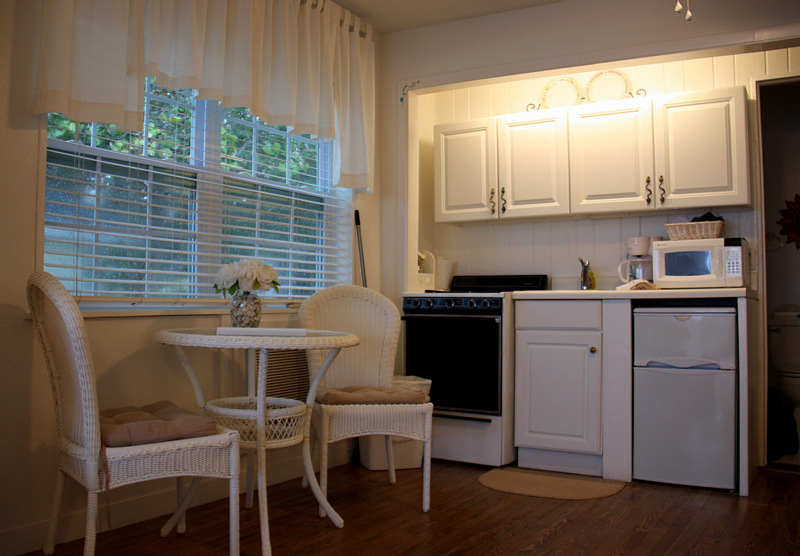 There are 15 bungalows at the resort. See the resort layout map here. 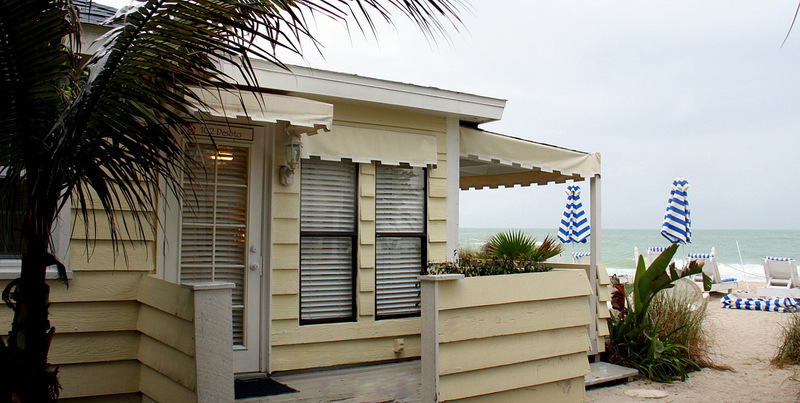 Bungalows 101, 102, 104, 105, and 116 all face the Gulf of Mexico and are closest to the beach and water. They are the best vantage points from which to appreciate the outstanding Florida sunsets. 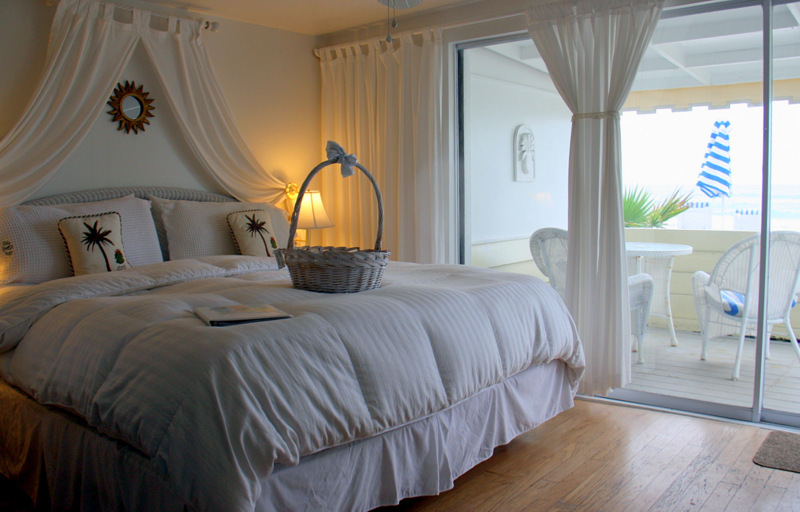 These rooms are among the most expensive at the resort, but are well worth the difference in price. 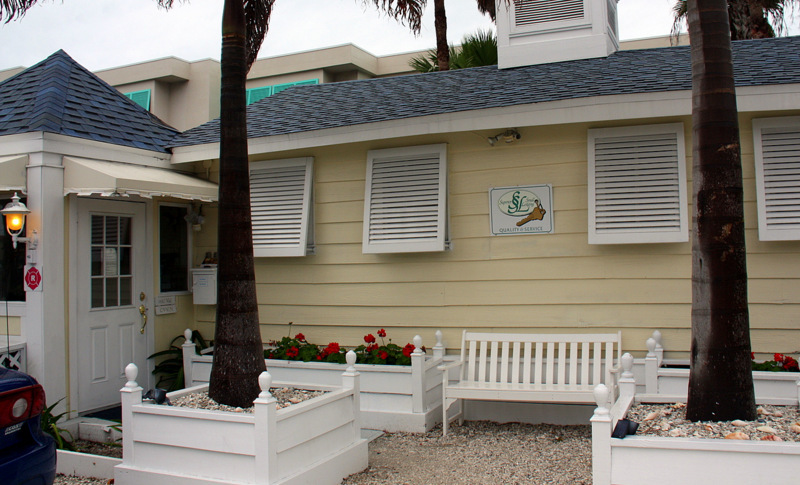 Anna Maria is awash in restaurants. We ate at two we can recommend – the City Pier Restaurant and the Sandbar Restaurant and Lounge. A specialty in this area is the Grouper Sandwich – try one – they are delicious. 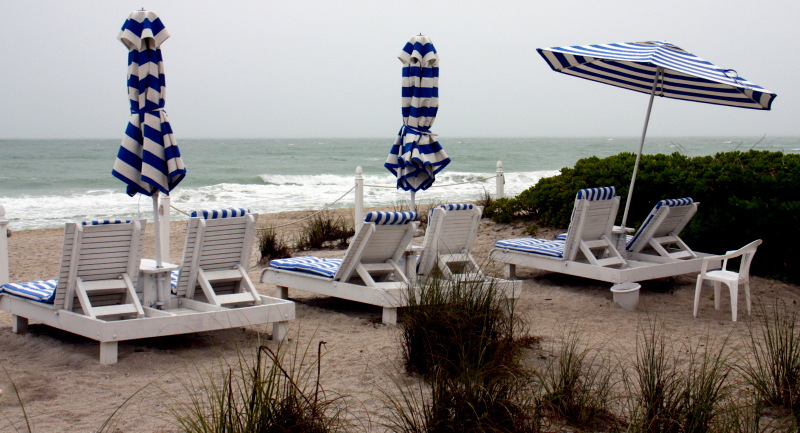 Anna Maria Island is the northernmost Key (or Cay) along the coastal Keys between Bradenton and Sarasota, Florida. The Gulf of Mexico runs along its western shore, and the Sarasota Bay is to the east. Florida state highway 789, a.k.a. the Gulf Drive divides the ultra-narrow island.